When I first visited Provence in 2000 on a heritage and cultural tour hosted by the Santa Barbara Museum of Art, I expected to find quaint towns with shutters and flowerboxes painted in traditional Provençal yellow and blue and cafes with Provençal rooster-printed tablecloths. © Snobby Tours® Inc. All Rights Reserved. 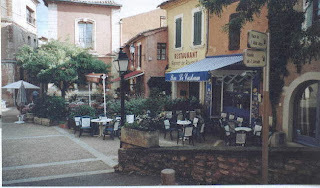 Not so with the colourful Medieval town of Roussillon in the Luberon region of Provence. The entire town is a myriad of colours, due primarily to the ochre pigments mined from the nearby clay quarries which have been used for the paints and cement stucco on the buildings. Mining of the ochre pigments intensified in the mid-1800's because the demand rose for the pigments to be used in the textile industry. 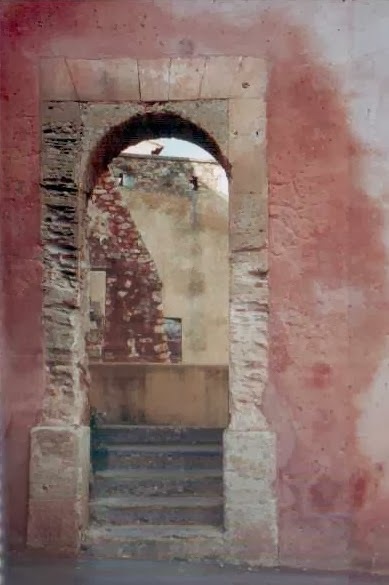 The extraction of the ochre pigments continued up to 1930, when it was prohibited in order to protect the sites from complete exhaustion. Some of the original quarries and ochre factories which were situated near Roussillon can still be seen today. This accounts for why the façades of Roussillon's buildings range from peach-coloured to rust, from light yellow to dark gold, from orange to deep red, and everything in between. What a "feast for the eyes" and the camera. There is beauty everywhere in this delightful Medieval town. I was enchanted, just as was the author Samuel Beckett, who spent time in Roussillon writing one of his novels. He also mentioned Roussillon in his famous play, Waiting for Godot. I spent a memorable October Sunday afternoon strolling through Roussillon's narrow Medieval streets which gradually wind uphill so that there are views of the gorgeous surrounding vistas of the Luberon. At every turn was a "Kodak moment". All afternoon I soaked in and photographed Roussillon's architecture and scenery with two couples from Germany. I even made friends at one of the sidewalk cafes with a Roussillon cat -- who, I might add, was visibly quite insulted and snooty when I originally spoke to it "dans l'Anglais au lieu d'en Français". How rude of me to expect "Monsieur Chat" to understand English!! I can't be more thrilled that we have Roussillon included in our custom-created itinerary for 2011 and 2012, "Best of Provence: A Cultural and Culinary Experience"©. We'll be spending an entire morning there, and I can hardly wait to see it again. I'll make sure I have plenty of film -- and have brushed up better on my French, in case I encounter my friend "Monsieur Chat" again in the cafe! More information about our "Best of Provence: A Cultural and Culinary Experience"© custom tour, including a Daily Itinerary, is featured on the Snobby Tours®, Inc. Website at http://www.snobbytours.com/BESTofPROVENCE2011-2012.html.